Skyrim fans are now able to more easily spend money on Bethesda's upcoming role-playing epic. The Collector's Edition, to release alongside the regular version of the game on November 11, 2011 on PlayStation 3, Xbox 360 and PC, will include a whole bunch of expensive, nerdy stuff. 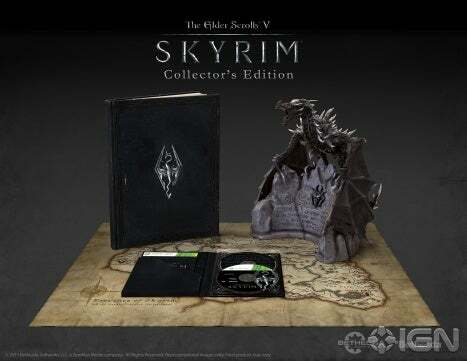 For $149.99 (US), you get a 12" tall dragon statue, a fancy art book and a DVD about the making of The Elder Scrolls V. Also, if you look at the screen, there's a giant cloth map. Where's my gold dragon? $150 and no gold or gold lace? I'm still buy the game regardless, but this just makes me cry like a sad panda. Is that enough to warrant spending so much? Do you feel it's missing anything?